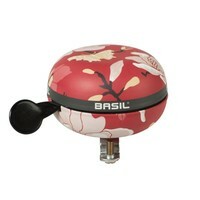 The Basil Magnolia Big Bell is a striking choice of bicycle bell and easily attaches to the handlebar of your bike. This beautiful dark grey bell emits a loud dong sound that keeps you audible to other cyclists, pedestrians and motorists while you’re out and about. An essential for cyclists who need to get from A to B safely and in style. This bell is easy to use and makes a fine complement to bikes whose owners prefer something with plenty of character and colour. A diameter of no less than 80 millimetres makes it instantly visible and incredibly easy to use. If you’re serious about road safety and don’t want to settle for second-rate designs, the Basil Big Bell Magnolia is just for you. A great gift idea for cyclists you love and the perfect treat for yourself should you be looking to overhaul your bike accessories, this bell is bound to become a firm favourite. Browse for more bicycle bells, or check out further first-rate accessories online today at Basil.